Some 650 dignitaries, customers and industry stakeholders joined DNV GL, ship classification society and risk and sustainability service provider, for a night in Hamburg. 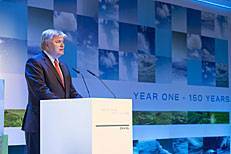 Held at the Fischauktionshalle Halle, the event celebrated the 150th anniversary of the foundation of Det Norske Veritas and the first year of operation of the newly formed DNV GL Group. The evening looked to both the past and the future of the company, celebrating both DNV GL’s long history and its continued drive to make a positive impact on the world through innovation. DNV GL Group CEO Henrik O. Madsen, reflected on this when focusing on the organization’s ambitious new report, “A Safe and Sustainable Future”. Michael Behrendt, Chairman of the Executive Board of Hapag-Lloyd AG, focused in his speech on the qualities that enabled DNV GL to have continued success for so long: “This mixture of courage and business consideration, of a will to innovate, of corporate responsibility and collective values and convictions within the company characterize the centennial champions who have managed to be successful for over a century and a half. It is values that belong to the DNA of a centennial company like yours – values that you cannot buy for all the money in the world. But above all, values that need to be cared for.” Following his speech DNV GL paid tribute to Behrendt’s own long and illustrious career of success, as he was due to celebrate his retirement as Chairman the following evening.